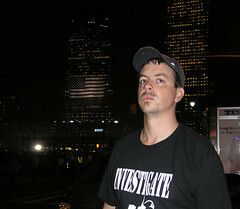 On Memorial Day, May 26 2008, Blair Gadsby will start his hunger strike for 9/11 truth outside the Phoenix, Arizona office of Senator John McCain. 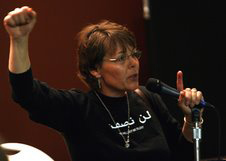 Last night I talked to Blair and Tim King from Phoenix 9/11 Truth about the motivation and intention behind this action, its possibilities for success and the ways in which we can help to spread the word about the hunger strike. At the beginning of the show I talk to Adam, Cody and Sam from We Are Change Kentuckiana and We Are Change Ohio about being attacked by the police at the NRA convention in Lousiville. 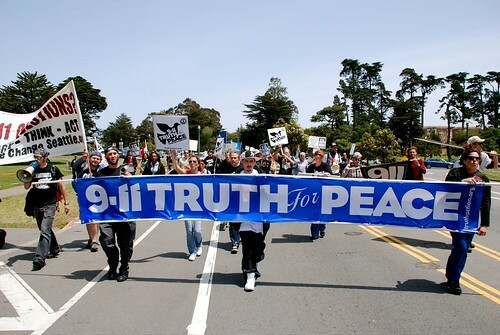 Broadcast live on the eve of May 11 2008 in the afterglow of the West Coast Convergence, this show features more 9/11 truth activists on one radio show at one time than ever before. And considering how many activists I've packed onto previous shows, that's saying something! From We Are Change LA we've got Bruno, Katy, Jeremy, Joel, Garko, Klara and Max. From We Are Change Seattle we've got Bob, Bob, Bob and Craig. 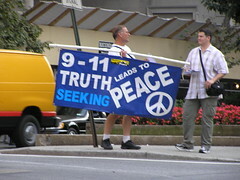 Also Robin Hordon and Mark from Ottawa 9/11 Truth and local SF activists Joe, kdub, Chris and Maria. Plus: Craig plays a song on his accordian! Excellent Discussion on Truth Revolution Sat., April 26th show. Cosmos talks to Joe from Los Angeles regarding the need for Prosecution, Legal Database and Legal Professionals for 911 Truth. On this show I am joined by two longtime indymedia activists and we discuss a wide range of topics with a focus on the indymedia network in relation to 9/11 truth, left gatekeeping, working with activists from diverse political backgrounds and the global importance of this issue that cuts to heart of the empire. Chris Burnett has been a part of indymedia since its inception in Seattle at the WTO protests, is a co-founder of IMC Los Angeles and the host of Indymedia On Air on Pacifica's KPFK in Los Angeles. Chris C has been politically active since the Poll Tax protests in the late 80s in England and works with indymedia UK. In the second segment I talk to Bruno Bruhwiler from We Are Change LA about making banners and standing up to FOX News in defense of free speech. Make use of your local indymedia! This is Cosmos' show at a new day and time. Betsy is the person helping me with 9/11 Truth activism in my area, and someone that is working towards showing 9/11: Press For Truth at a local movie theater every Tuesday in January and February of 2008. She is on for the second hour of the show. This is Betsy's first interview ever, and she did a great job. Richard Gage of Architects and Engineers for 9/11 Truth returns to Truth Revolution Radio to talk about his recent activities, his goal for signing up 1000 architectural and engineering professionals by 9/11/08 and the response to being attacked in a congressional hearing. 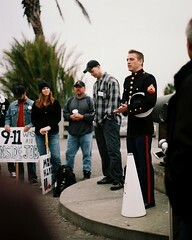 Johnny Wave of Marines for 9/11 Truth calls in with a passionate message and the launch of 911blacklist.org is announced. 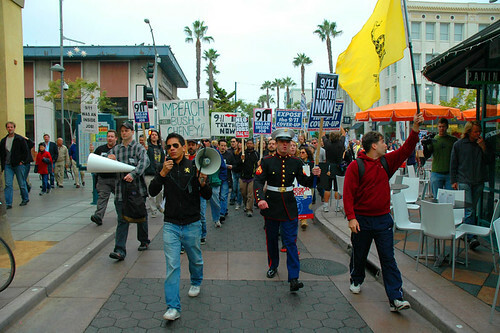 Randy, Zan and Stewart from We Are Change LA were the guests on the October 29 edition of Truth Revolution Radio. We talked about the Bill Maher disruption, Charlie Sheen's questioning of 9/11 and confronting the Skeptic's Society with actual skepticism. Drew from 9/11 Truth Tucson co-hosts. 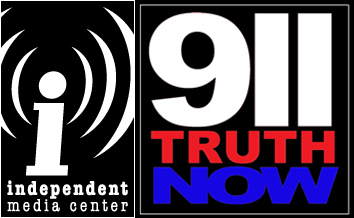 9/11 first responder Kevin McPadden was the guest on the October 17 edition of Truth Revolution Radio. Kevin was a witness to the demolition of WTC 7 and on this show we discuss in depth his experiences on 9/11 and the days following. When I asked Kevin what we can do to help him and other first responders, he replied "First and foremost - just keep waking people up. The more that people are aware, the more security that this is not gonna happen again, or it will not happen to this degree again." 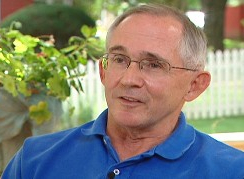 Activist and former FAA Air Traffic Controller Robin Hordon was the guest on the September 26 edition of Truth Revolution Radio and we talked about 9/11 from his perspective as an ATC and his views on the truth and peace movements based on four decades of experience with activism. This was one of my favorite shows so far.